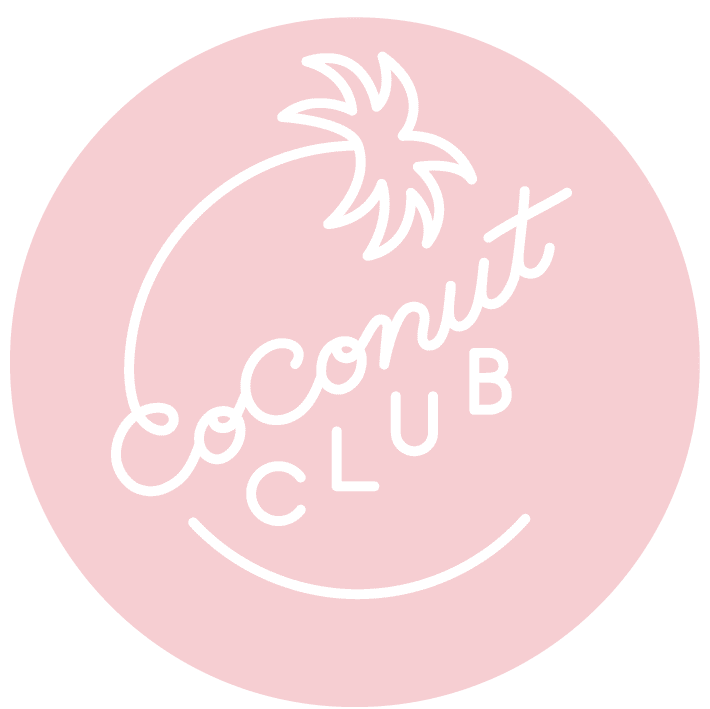 Coconut Club located behind Union Market is the new trendy vacation-inspired small plates and cocktail spot from four time Chopped champion and Beat Bobby Flay winner, Chef Adam Greenberg. The mix of soft and bright color tones invoke 90's beach vibes and has been trending all over Instagram with cute selfies from DC's millennials. Closest Metro is Gallaudet University. We went to check out Coconut Club for one final birthday celebration. As soon as we arrived, the bar area located in the middle of the warehouse, was already packed with a young crowd holding cocktails and loud music blaring. We were seated at a small table and looked over the menu. We decided to order a bunch of plates to share, when we noticed how small they truly were. First, Keith ordered the Tuk Tuk Goose made with vodka, Thai spiced tea, and ginger beer. 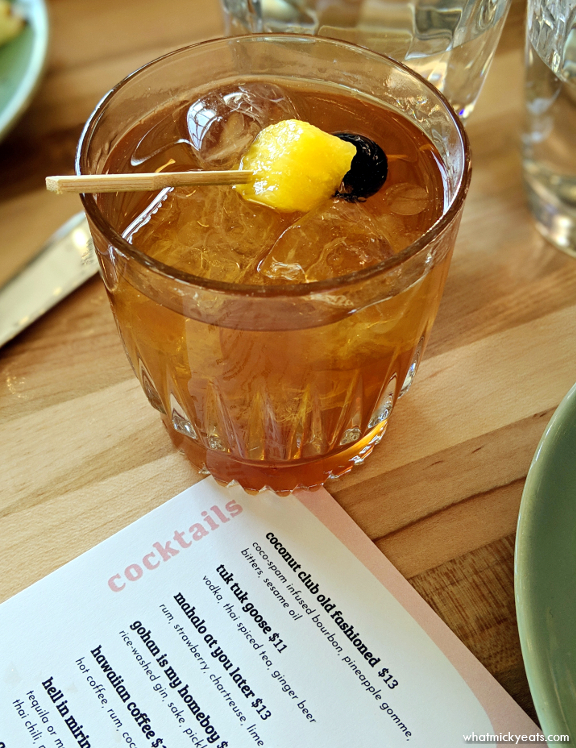 It was a tropical twist on the mule, but the ginger spice was overly strong and medicinal to Keith's liking, so he switched to the Coconut Club Old Fashioned made with coco-spam infused bourbon, pineapple gomme, bitters, and sesame oil. It was strong but tasty. 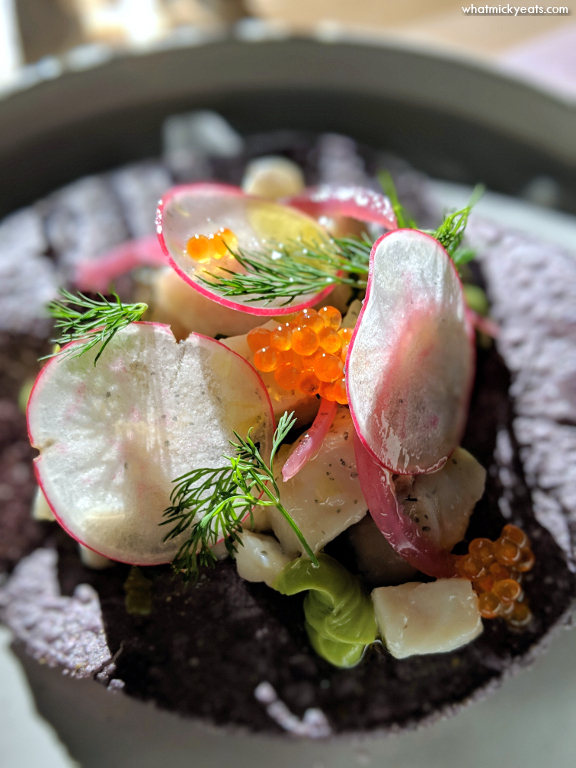 For starters, we shared the Kanpachi (amberjack) marinated in citrus juice served atop blue corn chips with avocado cream, sliced radish, pickled onion, and fresh roe. It was very bright and awoken our palate. 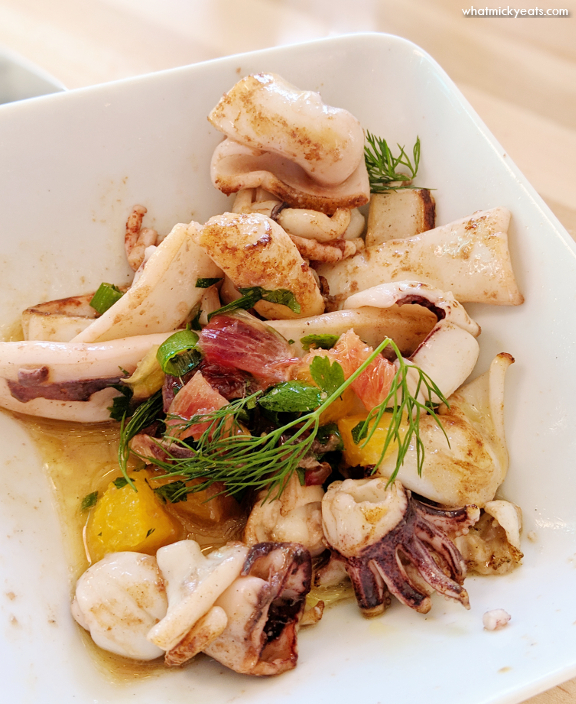 The Calamari a la Plancha had a great char flavor mixed with a winter citrus chimichurri. The calamari was very tender. 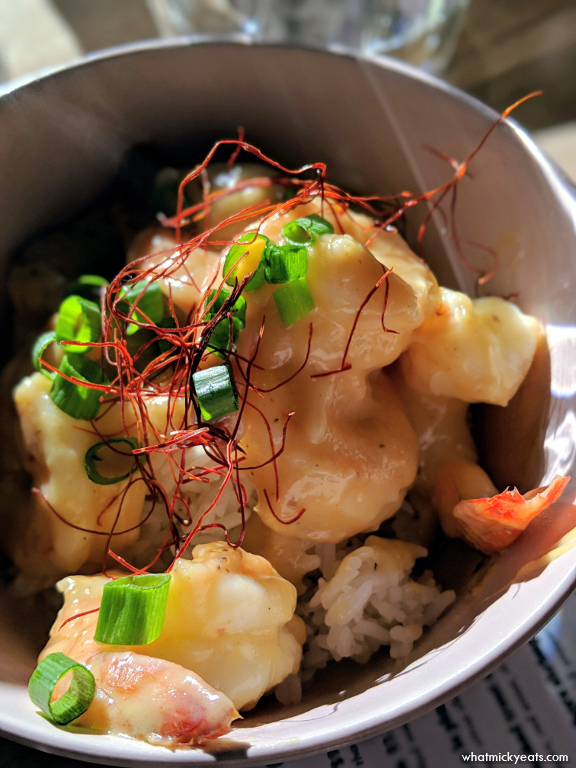 A favorite was their spin on North Shore Shrimp served with garlic confit and white rice. The description listed chili pepper, however the spice was completely missing from our dish. While the shrimp were cooked beautifully and the garlic sauce was addictive, it was just not quite the North Shore version I grew up with. 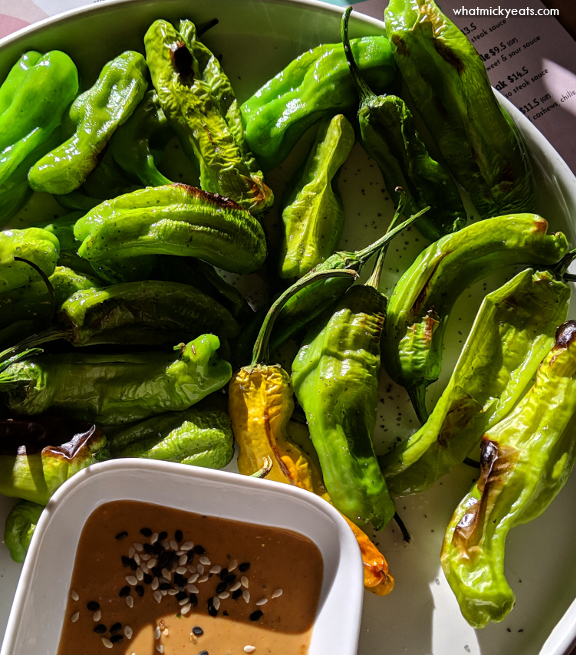 Keith wanted to try the Shishitos that came today served with a blended tofu sauce that was mild with subtle earthy flavor to counterbalance the spicy peppers. The serving size of this dish was quite large compared to others. Another enticing description that left me unsatisfied was the SPAM Fried Rice. 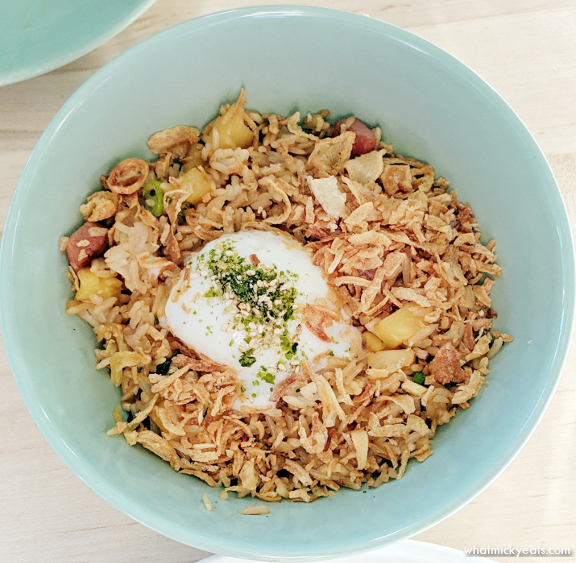 Topped with a soft egg, crispy shallot, and furikake, the SPAM was minimal and overpowered by pineapple instead. Also, I could not taste the furikake mix. 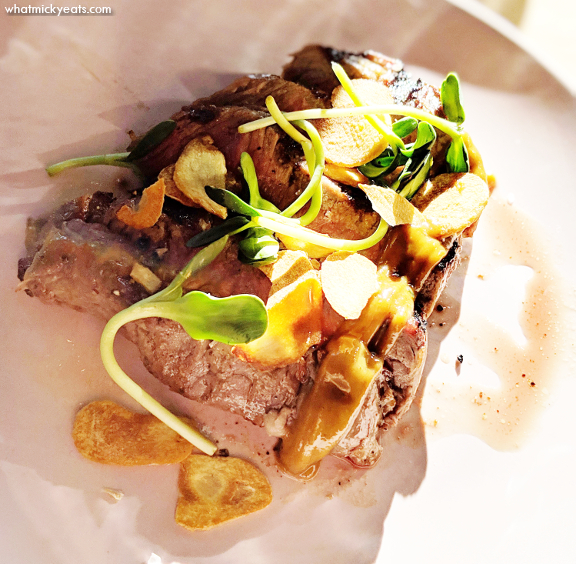 Since the grilled beef ribs were not available, Keith ordered the Sliced Steak instead that came with a white miso steak sauce and fried garlic chips. The meat was cooked well and had good flavor, but was a very small portion. 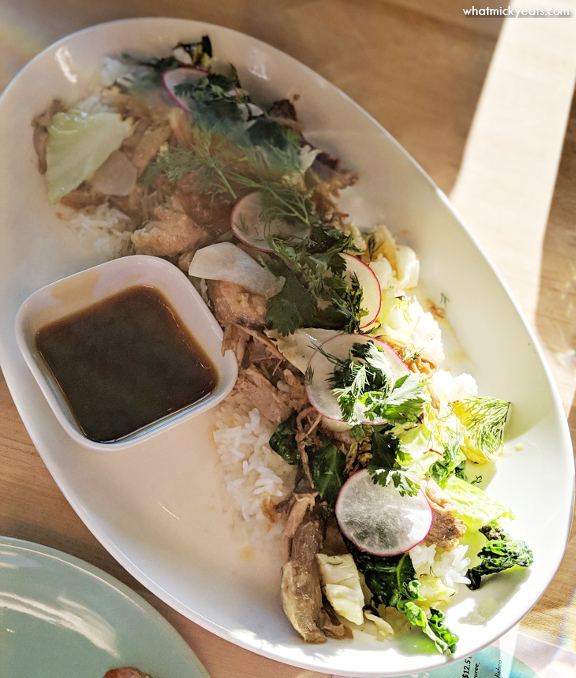 For a larger shared entree, we ordered the Kalua Pork served with cabbage and steamed rice. The pork was flavorful and a bit fatty served with a side of "kalua sauce" that tasted like a ginger teriyaki, but still was not exactly Hawaiian. 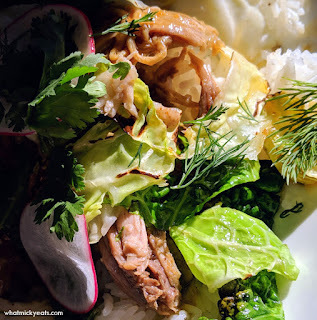 Real Kalua pork is cooked for hours in an underground oven - typically a whole dug in the sand and lined with hot lava stones then covered with hala tree leaves. The whole pig is placed inside and covered with ti leaves for extra protection before being fully covered by the sand again. 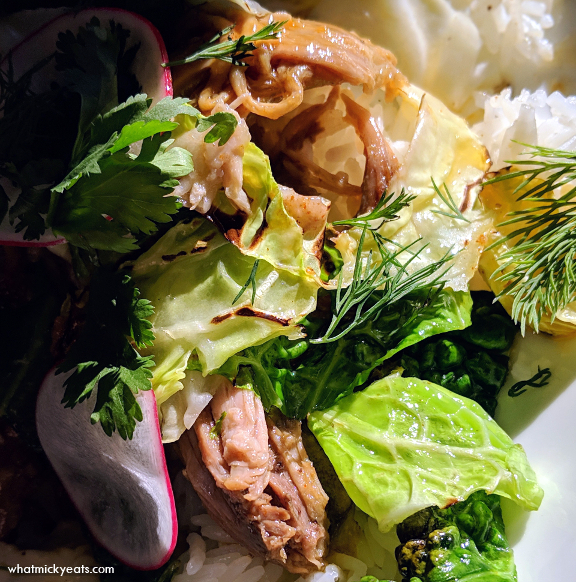 This type of cooking imparts much natural flavor into to pig by maintaining its natural moisture and lends to a delicate shredded pork after wards. 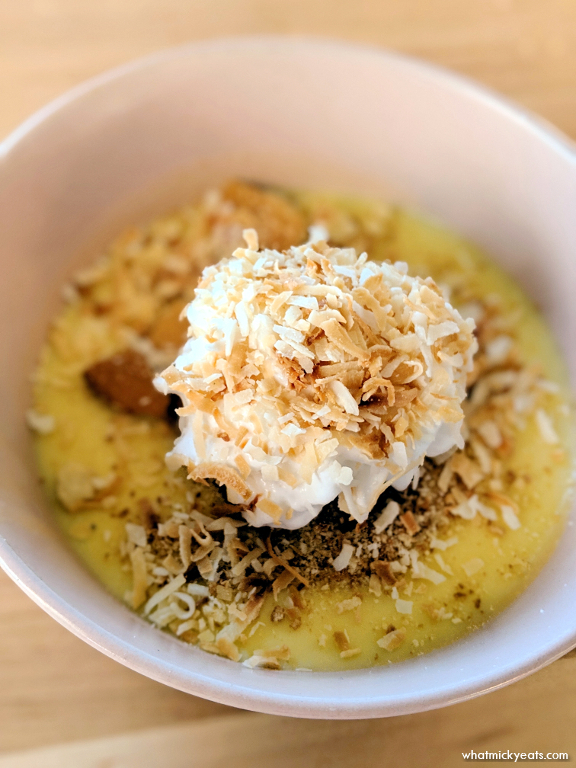 Lastly, for dessert we shared the Coconut Cream Pie - which was not a slice of pie at all, rather a bowl of the coconut custard topped with crumbles of Nilla wafers, whipped cream, and toasted coconut. The dessert was light and full of great coconut flavor that hit the spot.